Gulf Shores Alabama beachfront condo for sale at San Carlos. 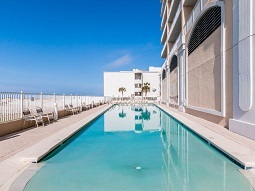 Nice 3BR/3BA unit located in the heart of Gulf Shores at San Carlos condominium. The unit is very spacious and ready for your family to enjoy. Walk to shopping and restaurants (including The Hangout). Great rental location and unit! Enjoy the beautiful sunrises and sunsets from the large balcony. San Carlos offers a nice zero entry pool, large gym overlooking the beach and owners meeting room. Covered parking for owners use.